Anybody for an actual RP thread??? » » » » » » Anybody for an actual RP thread??? I would like to get an actual RP thread going like the good old days. Anyone up for it? Re: Anybody for an actual RP thread??? Provisionally, yes, although it will depend on the specifics. I'd be looking for something investigatey, not something blam-die-blam-shoot-death-killy, as I tend to find that my inspiration starts to go after trying to write the third section in the same prolonged firefight. I know I'll regret this, but... if there's enough interest and momentum, I may reappear for this. One More Hit - A tale of addiction. Well I'm up for anything really. I'd just fancy a good old RP, right now I don't have a specific plan to work with but I'm open to ideas. I'm in to keeping it going. If Sarg's in, I'm in. Although I won't be able to contribute massively pre-July. in, I have tried to run one at school, but it failed. Previously was a Wolf Scout for the Adeptus Astartes Space Wolves Chapter was disowned by his father, Baldr Station killer a Rune Priest, for refusing to undertake in the blood riturals of the Guardians of the 13th Company. Shade now takes contract work throughout known space. This here is my very favourite gun...I call her rita. Even without considering he's not exactly the material for an Inquisitor-esque RP, he's wildly in conflict with the canon. Space Marines don't "quit" to take contract work. It's neither allowed, nor would they want to (they're heavily religiously indoctrinated and committed before the implantation even begins). Recruits with psychic potential are filtered out into the Librarium at an early stage and the likelihood of a non-Librarian developing powers is therefore almost infinitesimally low. Also, nobody has a Space Marine for a father. The implantation process has to occur before sexual maturity, and even if it doesn't render them sterile, they're frakking monks. Seriously, getting sexually aroused while in power armour would be unpleasant. 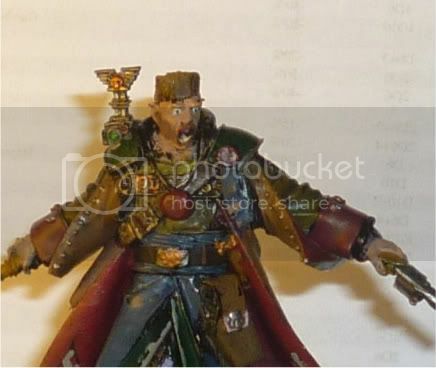 If anyone has canonical counter-examples of Space Marine fathers, the author responsible should be found, abused with a cactus and a croquet mallet, then shot. Sorry, but it seems you want to go in a direction very different to I was looking for in an RP. A Space Marine wouldn't work in the kind of setting I envision. That said, it does seem we have several people who are interested in an RP. I've got an assortment of ideas - my Dark Heresy game has thrown up a few concepts, but they'd have to wait years at our rate of progress, by which point they'd have been forgotten or the plot will have gone the wrong way to still use them. It'll take a while to develop them into a bit more than bullet points, but if we've got enough people interested, I can start putting something together. I would love to play in an RP, so count me in.